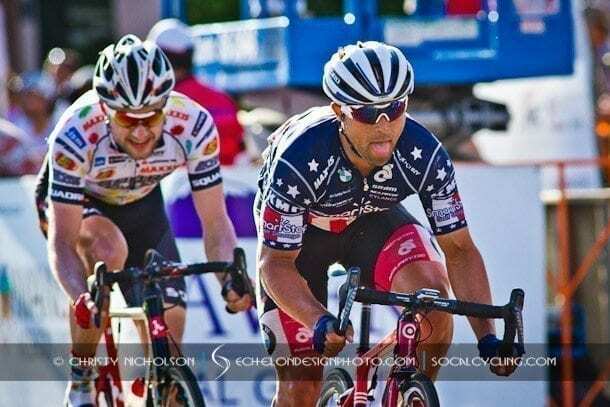 A hard fought battle for the Stars ‘N Stripes Jersey ensued in Greenville, South Carolina and the chance to earn the title of US Pro Criterium Champion. The Pro Women’s race was won by SoCal’s Kendall Ryan (Tibco-SVB) who narrowly escaped a last corner crash with some good bike handling after Ruth Winder’s (UnitedHealthcare Pro Cycling) wheel slid out while leading out 2014 Criterium Champion Coryn Rivera. Tina Pic (Pepper Palace Pro Cycling) and Brianna Walle (Optum p/b Kelly Benefit Strategies) rounded out the podium in second and third. The Pro Men’s Race was animated by a late solo attack by SoCal’s Tom Soladay (Optum p/b Kelly Benefit Strategies) with 13 laps to go. This put UnitedHealthcare Pro Cycling on the defensive as they tried to bring down the 15 second gap. Soladay was eventually caught after a great effort with a few laps to go. Eric Marcotte (Team SmartStop) jumped the group before the last turn and got a gap to hold off the field for the win and the jersey. Ty Magner (Hincapie Racing Team) finished in second and Luke Keough (UnitedHealthcare Pro Cycling) rounded out the podium in third. Watch Full Coverage of the Pro Women’s and Men’s races below. Above Photo – Eric Marcotte, who is the current US Pro Road Race Champion, recently raced at the Redlands Bicycle Classic in his Stars ‘N Stripes jersey in the Sunset Road Race.